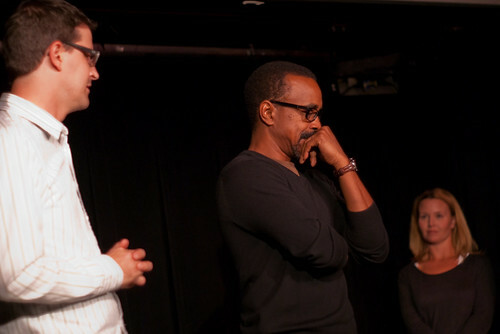 Following the truncated edition of the regular improv competition show Catch 23, Tim Meadows, Joe Canale, and Molly Erdman (the latter two of Second City Chicago) performed a short set of their own as part of the Comedy Bar’s first anniversary celebration week. After an odd fixation with the photographers at the front of the house (fixation would be one step below “problem”), and a request to turn the house lights up, Meadows told a few stories about growing up in Detroit watching the CBC (his favourite shows being Hockey Night in Canada and The Beachcombers), as well as his experiences shooting both Mean Girls and Ladies Man in Toronto. Fun fact of the day: Any smirk on Lindsay Lohan’s face at the start of a scene in Mean Girls is apparently the direct result of Meadows checking out her breasts before each take. 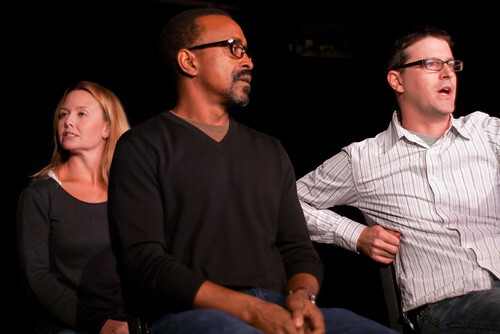 The improv set, of course, went by much too fast. If you’re planning to catch Tim & Co while they’re in Toronto – hopefully doing longer sets – note that the Sunday Night Live performance was moved to late Saturday night and subsequently canceled altogether due to scheduling issues. If you have tickets for SNL, check your inbox or contact Comedy Bar. And for the rest of you, there were still a smattering of seats available for the other two Saturday shows as of this morning, so you may be in luck!